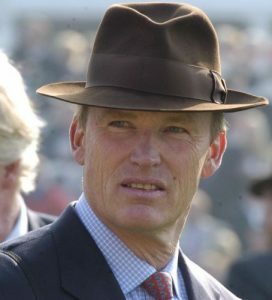 John Gosden served his apprenticeship as assistant trainer to two of the most influential figures in the history of horse racing, Sir Noel Murless and Vincent O’Brien, before setting up on his own in California in 1979. From small beginnings, he eventually trained over 500 winners during his time in California, before returning to England in 1989. Initially based at Stanley House Stables in Newmarket, Suffolk, Gosden moved to Manton, Wiltshire for the start of the 2000 season before returning to Newmarket in 2006. At that point, he moved into his current property, Clarehaven Stables, on the Bury Road just outside the town. All in all, Gosden has trained over 3,000 winners worldwide, 600 of which were in the US, demonstrating his international outlook and sucesses. He’s won the Flat trainers’ championship twice, in 2012 and 2015. Indeed, at the time of writing, he heads the trainers’ championship table once again, with 144 winners from 567 runners but, more importantly, over £6.3 million in prize money. Gosden has handled some exceptional horses over the years, winning the St. Leger four times, the Derby and the Oaks twice apiece and the 1,000 Guineas. More recently, he was won the Prix de l’Arc de Triomphe three times in the last four years, with Golden Horn in 2015 and Enable in 2017 and 2018. John Gosden’s phenomonal success on British Champions Day in 2018 ensured that he was crowned Champion Trainer that year. His stunning Qipco British Champion’s Day triple was made up of Roaring Lion in the Queen Elizabeth II Stakes, Stradivarius in the Long Distance Cup and Cracksman in the Qipco Champion Stakes.